This is the classic way to cook and serve acorn squash. Recipe includes variations for everyone’s taste. This is one of my family’s favorite way of cooking acorn squash. My daughter always wants this baked acorn squash for her birthday dinner. This squash is so delicious that it could be served for dessert! This stuffed squash is so easy-to-make and so good! Since it is also fall and squash is in season, I included acorn squash and Brussels sprouts. The vegetables roasted up nicely in the juices of butter, rosemary and garlic. This almost tastes like you are eating dessert! 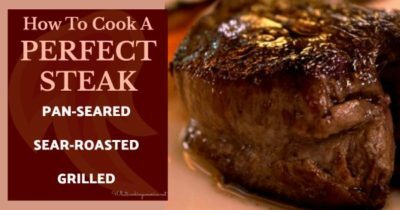 First I fell in love with the picture, then I read the recipe, and it grabbed me. Imagine, a perfectly roasted, very colorful bell pepper stuffed with a fresh basil leaf, home made basil pesto, goat cheese, and grape tomatoes. I came up with this recipe after looking over a few dozen recipes that just didn’t really excite me. Very simple to do and so good. Impress your family and guests with this delicious combination of potatoes and butternut squash. This butternut squash bread is very moist and so delicious! I couldn’t stop eating this bread. This butternut squash gratin is so good! This would make a great side dish for your Thanksgiving meal, but it is also good anytime. This is not only a delicious pizza, but a healthy pizza with the butternut squash. This is a different way to enjoy butternut squash. The fresh lemon is a wonderful addition. This delicious recipe was shared with me by Karen Calanchini, Food Stylist and Photographer, of Redding, CA. This is a very easy-to-make squash dish with a little “zip.” A fast and delicious accompaniment to any simply grilled, broiled, or roasted meat. This delightful and interesting soup is the signature soup at the Troppo Restaurant in Lansing, MI. This delicious easy-to-make squash recipe is from the Food Network Magazine. Since I love both butternut squash and pasta, this recipe immediately attracted my attention. We love the beautiful colors and the variety of ways to use them. Butternut squash is is a versatile favorite. We use half the squash for roasting, then cut the half with the seeds into cubes, put on a sheet tray and freeze. This is a very tasty side dish for your Autumn meals. It is so convenient to eat using a spoon right out of the skin. A favorite of mine is the Kabocha squash, also called Japanese Pumpkin. It is a beautiful squash with brilliant gold-orange flesh. his recipe is delicious! This recipe is from the cookbook Jacques Pepin’s Kitchen: Encore with Claudine, by Jacques Pepin. This soup was created to use up the remainder of the white meat from my Tuscan Lemon Chicken recipe. It is not only healthy and hearty, but surprisingly delicious and just perfect for our rainy nights. Delicata squash rings make an easy and healthful appetizer. Delicata squash is my favorite squash, and this is my favorite way to cook them. So easy-to make and so delicious! This is one of my favorite ways to cook delicata squash. I created these delicious savory rolls as a way to use some of my delicata squash. Spaghetti Squash is a great alternative to pasta when on a diet, as it is low in calories and gluten free. The cooked flesh of the Spaghetti Squash shreds into threads like thin spaghetti pasta or vermicelli. When zucchini squash are very small, there is no finer treat to be found in the vegetable world. This delicious recipe is summer in a burger, bursting with the peak of the season’s bounty from the garden. It sure was good, even my best critic loved it. Very fresh and pretty. This is a great pasta dish using vegetables from your garden or use the “odds and ends” from your refrigerator. This lasagna is a definite winner – it is so good! This Italian Vegetable Soup with Herbs and Rice is an all-vegetable Italian soup that is so rich and healthy and full of bright colors, great flavor, and very versatile. This is a very moist and delicious banana bread. The texture is more cake-like than other quick breads. My husband loved it! In a way this dish resembles macaroni and cheese with the macaroni substituted for squash. Zucchini is traditionally fried in a hot skillet in lots of oil, but cooking it in a crust in the oven leaves it less greasy and far more savory. These muffins would actually be perfect for late summer, when zucchini and basil plants are growing abundantly. There is a bounty of beautiful produce at our Farmer’s Markets now. The eye popping bell peppers caught my eye this week. This delicious and very easy-to-make Roasted Baby Squash recipe. A delicious hot zucchini soup using roasted vegetables. The fresh lemon juice compliments the squash and the browning gives it a complexity that enhances the banana peppers sweetness. This recipe below is the perfect meal for an outdoor party. I’m always looking for new ideas and recipes for using my Sourdough Starter. This bread recipe is perfect as the bread is so so easy-to-make and delicious! A delicious and spicy soup that provides another way to use zucchini squash. This is another great way to enjoy those large zucchini’s in the garden. I am addicted to this soup. It is very rich and complex, with the different types of tomatoes, and all the colorful vegetables. This is a very colorful and healthy dish. This is a very simple dish what brings out the flavors of the heirloom squash and tomatoes. A delicious soup using delicious and healthy vegetables. What to do with all those zucchini squash in your garden – make zucchini bread of course! Classic clam chowder remade with fresh summer corn and zucchini. This is a very colorful and tasty frittata. Any leftovers keep well and can be gently reheated and served the next day. This is also a very healthy dish, and is perfect for a hot summer evening. This is one of those dishes that I created at the last moment with what was in the garden. It is definitely a keeper! This Zucchini Crust Pizza with Fresh Herbs recipe was an unexpected surprise! It works perfectly and is very tasty. This is a “must make salad” during zucchini season. The walnuts takes this lasagna to another level! Here is a quick bread to make now and then freeze for later use. 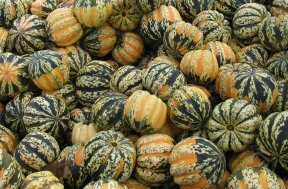 I am looking for a simple healthy recipe for Carnival Squash. Carnival Squash is the same type of Acorn Squash. Any recipe that calls for Acorn Squash would work. Check out What’s Cooking America’s web site on different types of squash and how to use them.